Pride Month is an opportunity to acknowledge and celebrate the decades of activism and advocacy that brought about monumental change for the LGBTQ community in Canada. The latest Heritage Minute, which premieres today, puts a spotlight on one of those activists – James “Jim” Egan. It will be the first Heritage Minute to address LGBTQ issues. “He was a dynamo,” says Don McLeod, Egan’s biographer and the head of book and serials acquisitions at University of Toronto Libraries. 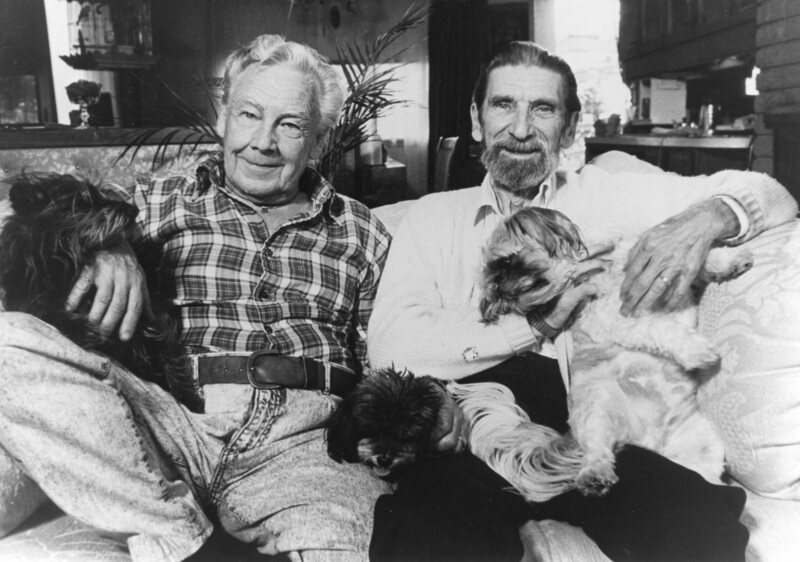 Egan, born in 1921, spent much of his life advocating for gay rights in Canada. As an openly gay man, he wrote regular letters to newspapers and tabloids from 1949 onward denouncing the way LGBTQ people were portrayed in the media and by the public. In 1948, Egan met John “Jack” Nesbit, beginning their 52-year relationship. In the 1980s, Egan and Nesbit were denied spousal support under the Old Age Security Act – a move that Egan challenged all the way to the Supreme Court of Canada. The Supreme Court dismissed the appeal in 1995, but made a paramount ruling to include sexual orientation as grounds for discrimination in the Charter of Rights and Freedoms. “They had to change the laws in many different ways. I think it had quite a significant impact on the road to gay marriage, for example,” says McLeod. While McLeod was working as a volunteer at the Canadian Lesbian and Gay Archives in the 1990s, he came across Egan’s archives, finding them so fascinating that he contacted Egan about writing a book. Egan agreed – periodically sending McLeod tapes, which McLeod transcribed. In 1998, they published Challenging the Conspiracy of Silence: My Life as a Canadian Gay Activist. During the making of the book, McLeod got to know Egan. McLeod’s encyclopedic knowledge of Egan (in fact, McLeod just wrote the Canadian Encyclopedia’s entry on Egan) made him the perfect person to consult with on the creation of the Heritage Minute, says Davida Aronovitch, Heritage Minutes' manager for Historica Canada. McLeod was able to confirm details from Egan’s life – from the crucial to the minute. Aronovitch recalls, for example, calling him up to ask about the rings Egan and Nesbit wore. “We just wanted to confirm they did in fact wear them on their ring fingers and that they were gold bands because we were looking to get bands for the actors and we need to have them placed correctly,” she says. In 2014, Historica donated the Heritage Minutes archives to U of T Libraries' Media Commons – almost 300 banker boxes full of tapes, scripts and other items from its 26 years of broadcasting one-minute, dramatized moments of Canadian history – stored at U of T Libraries’ Downsview facility. Beyond his work with McLeod, Egan has some strong U of T connections. During the Second World War, Egan worked at U of T’s department of zoology as a departmental technician, says McLeod. He was then seconded to Connaught Laboratories where he worked in the insulin production factory until 1943. “Jim was always interested in natural science – he had a lot of experience working on farms when he was a teenager in Ontario and he was keen on the natural world,” says McLeod. Egan’s long life full of varied experiences was part of the appeal for Historica Canada when it was looking for a subject for its next Heritage Minute, says Aronovitch. “This is a really unique story in that it spans a very many years,” she says. “What that means is we were able to show different aspects of the fight for equal rights within the LGBTQ movement just by sharing Jim's story.